Wellington Girls’ College is an all girls state high school with a roll of 1450 students including 60 international students from Asia and Europe. We enrol students from Year 9 (13 years old) – Year 13 (18 years old). 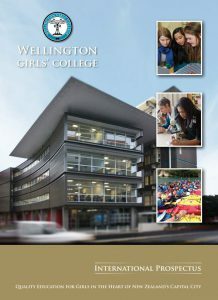 Wellington Girls’ College has a long-standing reputation of excellent teaching and extra-curricular programmes and our national examination results are consistently amongst the top results for state high schools in NZ. There is a strong demand for places for New Zealand and overseas students at Wellington Girls’ College. Students in Years 9 – 12 wear uniform, Year 13 students do not wear uniform. Wellington (Te Whanganui-a-Tara) is the capital city and second most populous urban area of New Zealand, with 412,500 residents. It is located at the south-western tip of the North Island, between Cook Strait and the Remutaka Range. The college is conveniently located in the heart of Wellington, three minutes’ walk from the transport centre and from government, five minutes’ walk from central city shopping. Drama, music, debating, cultural activities and clubs are an important part of daily life outside the classroom and students are encouraged to join extra activities during their time at school. Each year there are one or two major drama productions. We have a variety of choirs and orchestra groups which practise and perform throughout the year. Click here for more information about WGC Music. Wellington Girls’ College occupies a small campus surrounded by diplomatic, commercial and residential buildings. The school has modern equipment and teaching spaces and makes good use of modern technologies including WIFI throughout the school. In addition to our own gymnasiums and sports field we have easy access to city facilities for practice and competition. The International Programme is based in the International House with English Language classrooms, staff offices, kitchen facilities, Wifi and computer access.